Here are some snazzy birthday facts about 11th of October 1976 that no one tells you about. Don’t wait a minute longer and jump in using the content links below. Average read time of 10 minutes. Enjoy! 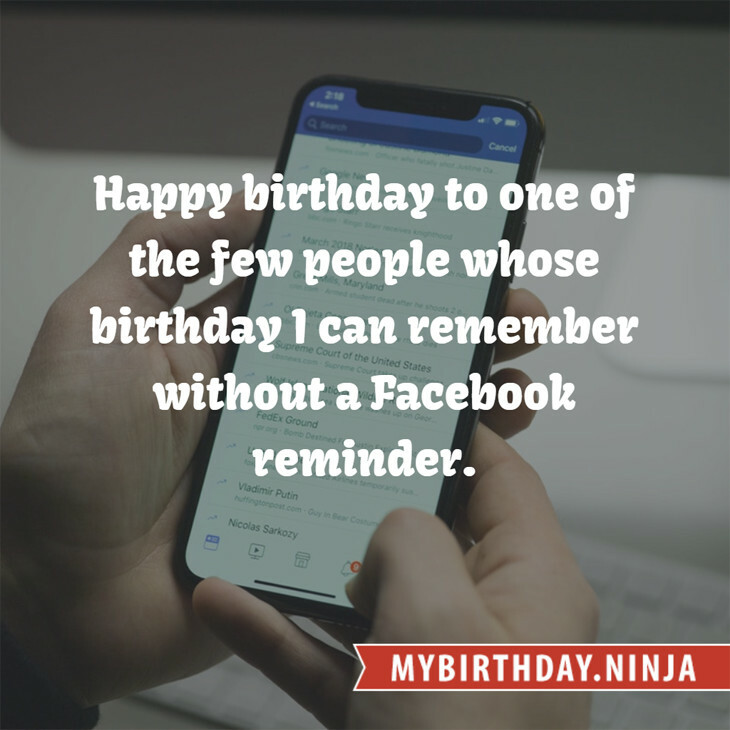 What day was my birthday Oct 11, 1976? October 11, 1976 was a Monday and it was the 285th day of the year 1976. It was the 41st Monday of that year. The next time you can reuse your old 1976 calendar will be in 2032. Both calendars will be exactly the same! This is assuming you are not interested in the dates for Easter and other irregular holidays that are based on a lunisolar calendar. What day is October 11 this year? There are 175 days left before your next birthday. You will be 43 years old when that day comes. There have been 15,530 days from the day you were born up to today. If you’ve been sleeping 8 hours daily since birth, then you have slept a total of 5,177 days or 14.17 years. You spent 33% of your life sleeping. Since night and day always follow each other, there were precisely 525 full moons after you were born up to this day. How many of them did you see? The next full moon that you can see will be on April 19 at 11:14:00 GMT – Friday. Fun stat: Your first one billion seconds (1,000,000,000) happened sometime on June 19, 2008. If a dog named Bucks - a Tibetan Terrier breed, was born on the same date as you then it will be 188 dog years old today. A dog’s first human year is equal to 15 dog years. Dogs age differently depending on breed and size. When you reach the age of 6 Bucks will be 40 dog years old. From that point forward a small-sized dog like Bucks will age 4 dog years for every human year. View the complete list of October 11 celebrity birthdays. Who are the famous October 11 birthdays? Here’s a short list of famous people in history who were born on Oct 11. View the complete list of October 11 famous birthdays. What happened on my birthday – Oct 11th? A massive earthquake strikes Aleppo, Syria. Because of the adoption of the Gregorian calendar, this day does not exist in this year in Italy, Poland, Portugal and Spain. The Burchardi flood: “The second Grote Mandrenke” killed around 15,000 men in North Friesland, Denmark and Germany. Along the Natchez Trace in Tennessee, explorer Meriwether Lewis dies under mysterious circumstances at an inn called Grinder’s Stand. A big demonstration at the gates of the legislature of Buenos Aires forces the ousting of governor Juan Ramón Balcarce and his replacement with Juan José Viamonte. The Western League is renamed the American League. Apollo program: NASA launches Apollo 7, the first successful manned Apollo mission, with astronauts Wally Schirra, Donn F. Eisele and Walter Cunningham aboard. George Washington’s appointment, posthumously, to the grade of General of the Armies by congressional joint resolution Public Law 94-479 is approved by President Gerald R. Ford. Cold War: U.S. President Ronald Reagan and Soviet leader Mikhail Gorbachev meet in Reykjavík, Iceland, in an effort to continue discussions about scaling back their intermediate missile arsenals in Europe. View the complete list of October 11 historical events. What does my birthday October 11, 1976 mean? Your birthday numbers 10, 11, and 1976 reveal that your Life Path number is 8. It represents experience, authority and endeavour. You are gifted with natural leadership and the capacity to accumulate great wealth. The following celebrities also have the same life path number: Luis Manzano, Stanislav Ianevski, Jere Burns, Vilis Daudziņš, Rob Rackstraw, Pat Roach, Franco Interlenghi, Ruth Jones, Doc Neeson, Ann Todd. 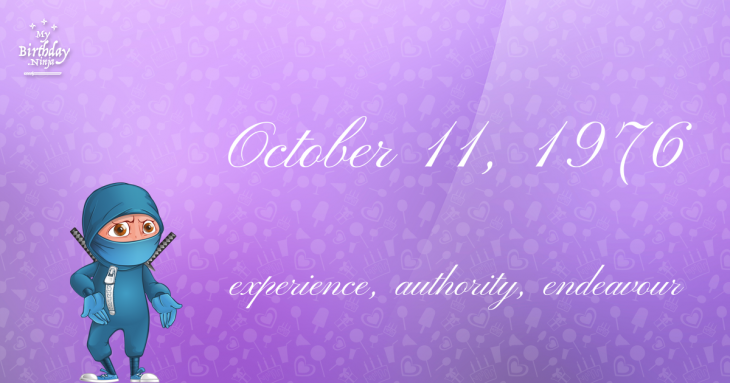 What is the birthday horoscope for Oct 11, 1976? The Western zodiac or sun sign of a person born on October 11 is Libra ♎ (The Scales) – a cardinal sign with Air as Western element. The ruling planet is Venus – the planet of love and beauty. According to the ancient art of Chinese astrology (or Eastern zodiac), Dragon is the mythical animal and Fire is the Eastern element of a person born on October 11, 1976. What is the birthstone for October 11? Fun fact: The birth flower for 11th October 1976 is Cosmos for constancy. What is the Love Match for Oct 11, 1976? When it comes to love and relationship, you are most compatible with a person born on September 1, 1976. You have a Love Match compatibility score of +135. Imagine being in love with your soul mate. On the negative side, you are most incompatible with a person born on April 13, 2000. Your incompatibility score is -143. You’ll be like a cat and a dog on a love-hate relationship. Arf-arf, I want to bite you. Meow-meow, stay away from me! What is a good birthday trivia for October 11? The number-one hit song in the U.S. at the day of your birth was Disco Duck (Part 1) by Rick Dees and His Cast of Idiots as compiled by Billboard Hot 100 (October 16, 1976). Ask your parents if they know this popular song. I do not know how you feel about this, but you were a male ♂ in your last earthly incarnation. You were born somewhere around the territory of Poland approximately on 725. Your profession was digger, undertaker. How many babies were born on October 11, 1976? Base on the data published by the United Nations Population Division, an estimated 121,620,578 babies were born throughout the world in the year 1976. The estimated number of babies born on 11th October 1976 is 332,297. That’s equivalent to 231 babies every minute. Try to imagine if all of them are crying at the same time. What is the popular baby name on 11 Oct 1976? What’s your bizarre Florida Man story? The #FloridaManChallenge is breaking the Internet and social media. Some crazy men, women, or creatures from the Sunshine State are making headlines every day of the year including your birthday. Try this fun exercise. Pick your search engine of choice and type in “florida man October 11” and see what kind of wild news headline you will get. This viral craze started in 2013 and gets resurrected now and then. The latest was from Tumblr and found its way to Twitter. As they say, the rest is history. Here’s a quick list of all the fun birthday facts about October 11, 1976. Celebrities, famous birthdays, historical events, and past life were excluded. Try another birth date of someone you know or try the birthday of these celebrities: November 22, 1982 – Charlene Choi, Canadian-Hong Kong singer and actress (Twins); December 23, 1988 – Thomai Apergi, Greek singer; May 1, 1924 – Big Maybelle, American singer and pianist (d. 1972).